We're the same way. 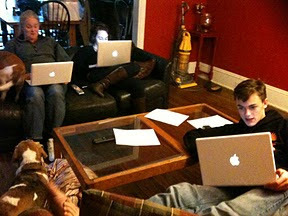 I was laughing when I took a picture of the family at the train station and we all had iPhones or MacBooks in our hands. I seriously should have purchased stock (20 years ago). Good looking geeks. Hope you have shares in Apple.